Almost 12,000 vehicles and more than 2,600 drivers were placed out of service (OOS) by commercial motor vehicle (CMV) enforcement personnel as part of the Commercial Vehicle Safety Alliance’s (CVSA) International Roadcheck inspection and enforcement initiative, June 5-7. The initiative is a three-day enforcement event throughout the United States and Canada when CVSA-certified inspectors conduct roadside inspections of commercial trucks and buses and their drivers. The inspections took place at inspection sites, weigh stations, and roving patrol locations along roadways. Enforcement personnel conducted 67,502 Level I, II, and III roadside inspections on large trucks and buses over the three-day period. This year’s inspections focused on hours-of-service (HOS) compliance, shortly after the electronic logging device (ELD) mandate going into effect on Dec. 18, 2017, and the CVSA’s North American Standard OOS criteria going into effect on April 1. More than 60,000 of the inspections were conducted in the U.S., and about 7,000 in Canada. CVSA reported that HOS violations represented 43.7 percent of all driver OOS conditions. However, of the total number of Roadcheck inspections, less than 2 percent of drivers were placed OOS for HOS violations. 3.9 percent of drivers inspected were placed OOS for driver violations. 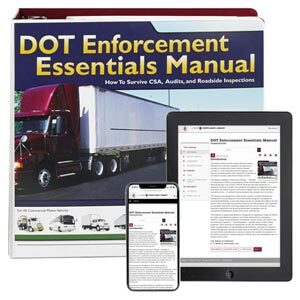 J. J. Keller's DOT Enforcement Essentials Manual is a tool that helps proactively enforce in-house and roadside compliance and prepare for FMCSA audits.